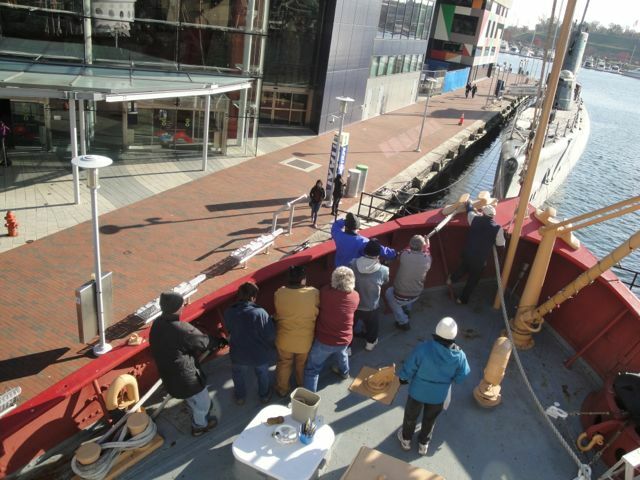 Workday: Historic Ships In Baltimore – Nov 22, 2014 – Chesapeake Chapter U.S.L.H.S. Volunteers pull the bow line so the chaffing gear can be positioned. There was a large crew for the last workday up in Baltimore. It was a brisk day with highs in the 40s. 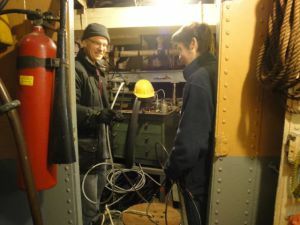 The ship was very cold when we first arrived so one of Greg’s first tasks was to fix the electrical problem that was preventing the heat from working. It’s a good thing Greg knows his electronics. We saved the painting chores for later in the day in the hopes that the ship would warm up. Greg was able to fix the problem and indeed it did eventually warm up. 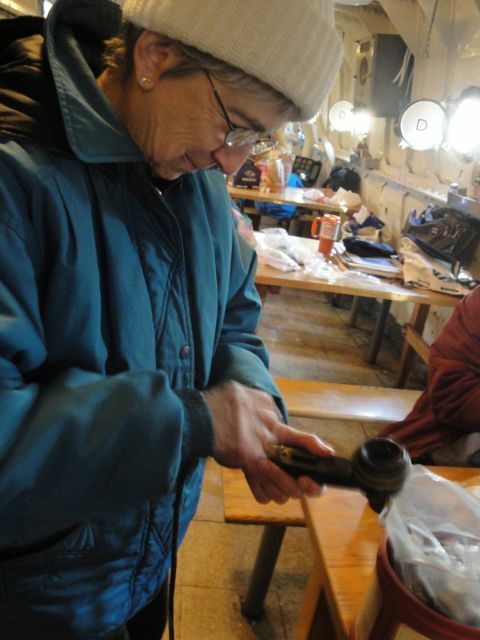 The dozen volunteers were very productive – it helped keep warm if we were moving! 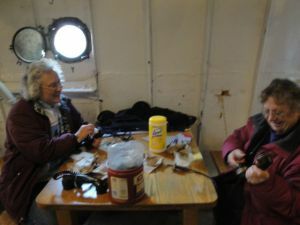 The first couple of volunteers to arrive started on the work on the electrical outlets in the CO’s cabin next to the wheelhouse. The rest of us started work at various tasks trying to check things off the list Greg had prepared. We started on what looked to be a simple task – removing the light fixture in the wardroom – but it turned out to be a bit of a challenge since the power had to be off (meaning it would be rather dark) and it was a bit uncooperative. 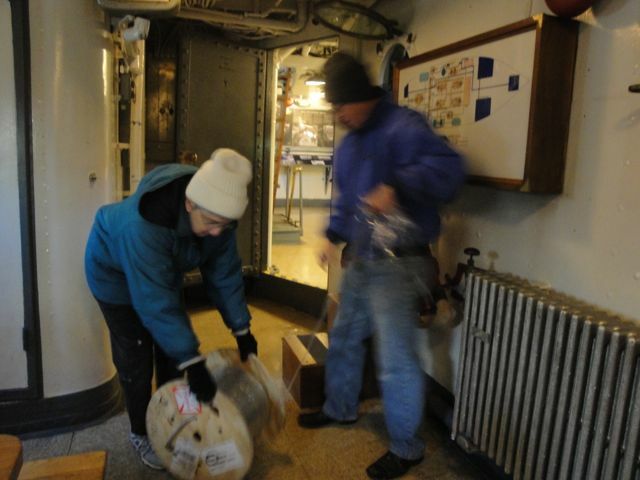 But in the end the mission was accomplished and one of the florescent light fixtures in the wardroom was removed. Later when it was a bit warmer the ceiling where it had been was primed and then a bit later it was painted the same mint green as the rest of the room. 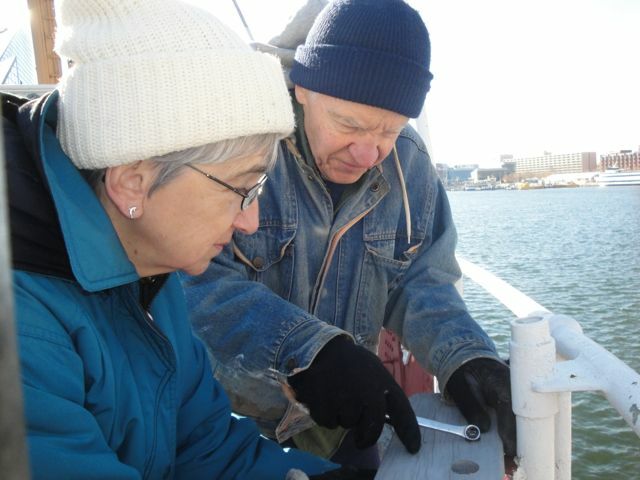 The tattered USLHS pennant was replaced with a new, smaller one for the winter months. The Swab Rack made by Hobie was removed and painted. It will be returned to the deck in spring. The phone handsets were taken apart cleaned and then, with some difficulty reassembled. The wires from the general quarters bell system were traced to the DC power panel. The small Christmas tree was put up and lit in the CO’s cabin. 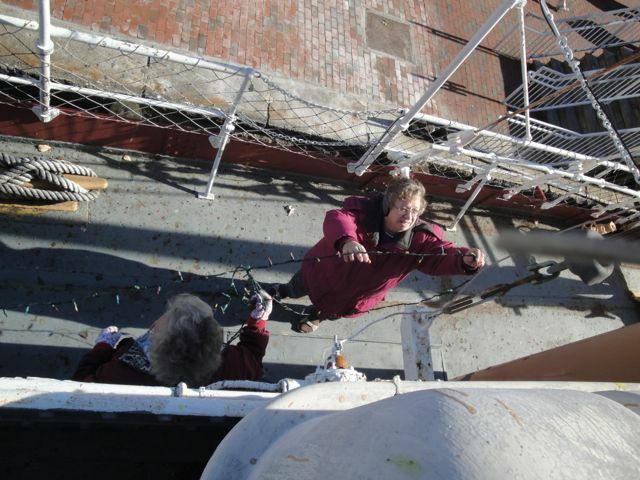 The holiday lights were hung pretty much where ever we could manage to hang them. The 18-gage wire for one of the general quarters switch was replaced with 14-gage wire. 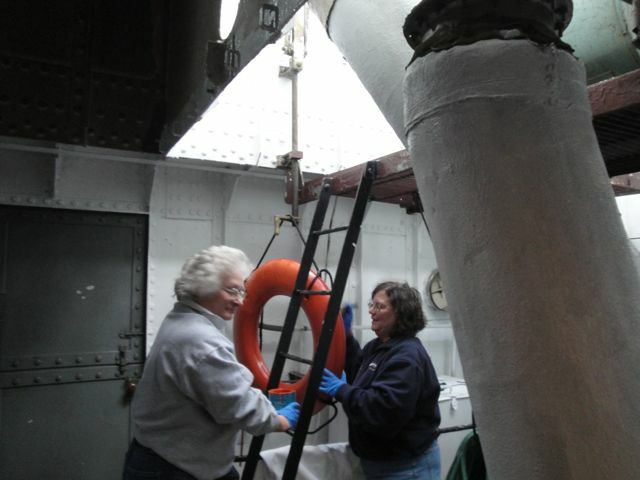 The chaffing gear was moved to its correct position requiring the muscle of many of the volunteers. 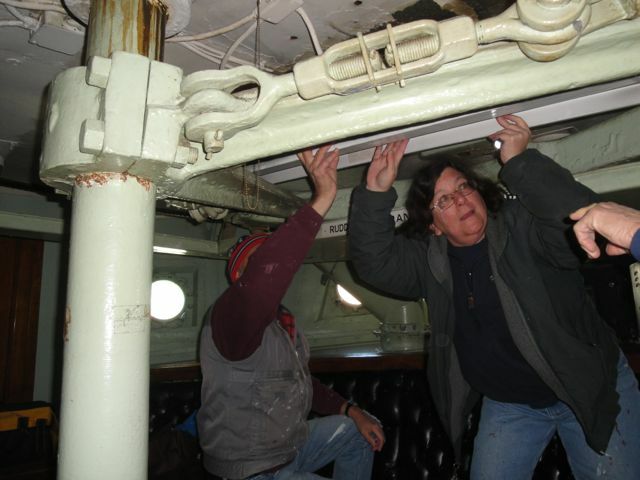 A large cabinet in the wardroom was repositioned so access to the light brackets was possible. Greg also tested the Emergency and Exit light fixtures. 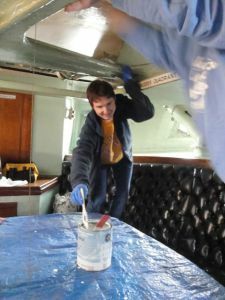 Our Chapter volunteers were joined by a high school student volunteer who chose the lightship as his community service project. 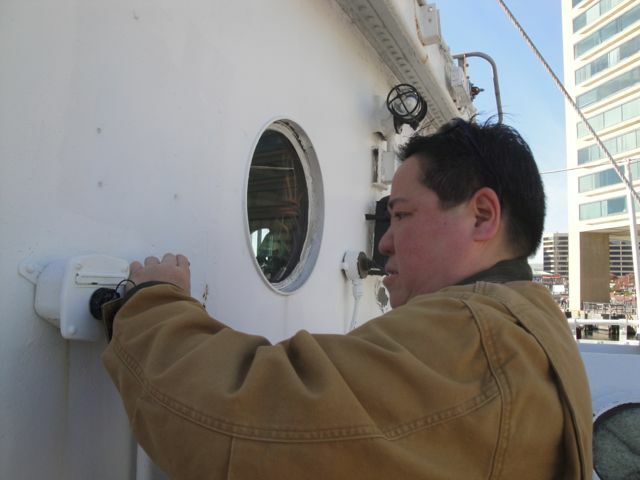 When asked why he made this choice he said working on the ship sounded interesting. He was a great help and a hard worker. 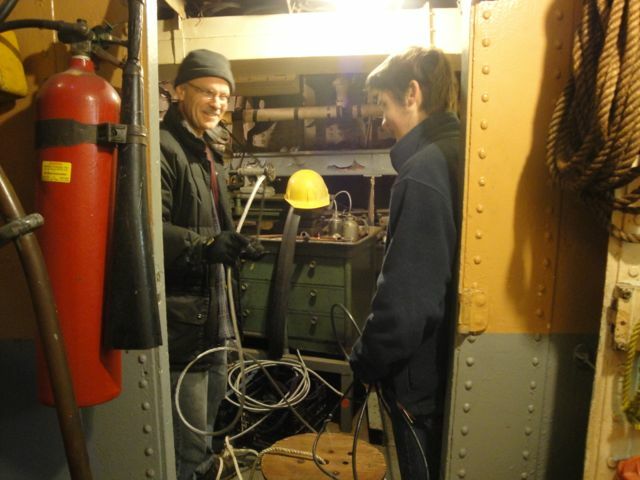 We have had one other student volunteer in the past help us out at Ft. Washington and the lights of the Calvert Marine Museum. 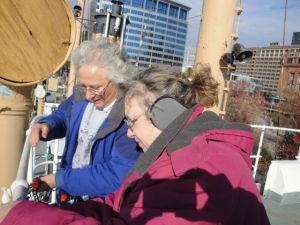 It’s a great way for them to get their community service requirements and do something a bit out of the ordinary – and we have fun working with them. There were other tasks performed as well, but with this many people I didn’t quite get it all down. It was a pleasant day and as always there was much laughter and companionship. It was a nice way to close out the season. Susan Duke wraps wiring in bracket on deck. Barbara and Lawrence Witucki remove the swab rack. 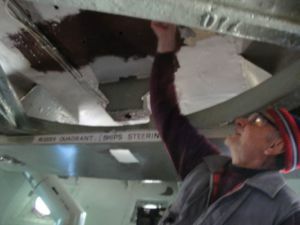 Tony puts primer on ceiling. Student volunteer Aidan paints wardroom ceiling. Andy and Aiden work on wiring in drill press room. Lauren and Heidi clean phone handsets. 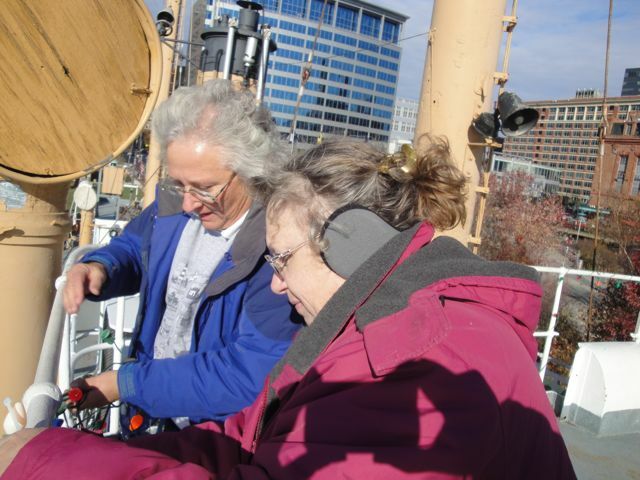 Barbara and Hobie taking wrapping off cable. Heidi and Lauren hanging lights. Lauren and Heidi hang lights. Paula and Anne paint life ring.